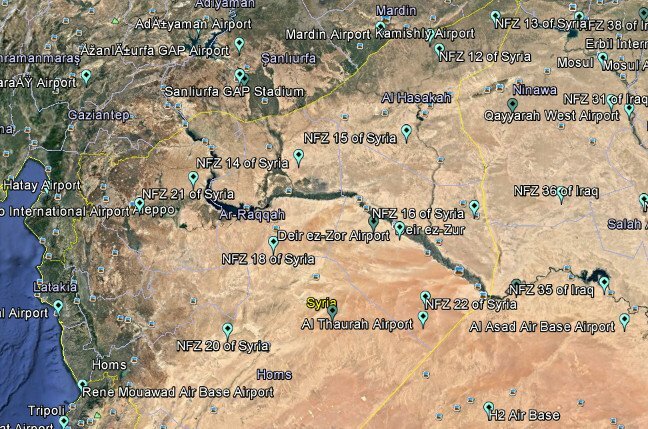 Drone bods DJI has quietly released a series of software updates that geofence off large areas of Iraq and Syria – indicating the Chinese firm is covertly helping the US war against Islamic extremists. The updates, quietly made to DJI’s Go app without any public fanfare, will prevent drones made by the firm from flying over large areas of Iraq and Syria. These no-fly zones are in addition to the usual NFZs implemented around airports and military airfields. Others in the drone world along with Finisterre have questioned whether geofencing will really stop Islamic extremists from using drones fitted with cameras as an inexpensive precision aerial strike weapon. A relatively new tactic is to strap a grenade or similar small IED to the drone before dropping it off over the target. DJI did not respond to emails from us to its press office seeking comment. “The use of consumer-drone technology to harm anyone is deplorable. Any loss of life or injury in such a manner is tragic. Those who carry out such acts should be prosecuted to the full extent of the law,” said the company in a statement issued last year, following a drone attack that reportedly used one of their products. A Google Earth map of the updates prepared by Finisterre (available here on Github, 330kB download, right click and “save as”) shows all of the NFZs implemented by DJI, including the latest ones. The no-fly zones were implemented between 25 and 27 February. Finisterre points out that at the same time, US-backed Iraqi military units were mounting an offensive into the western Mosul area. NFZs 31 and 38, implemented on 27 February, cover the city of Mosul. Other NFZs have long existed in DJI’s software. Tiananmen Square is one of the notable areas over which amateur DJI users cannot fly their toys. Most US airports are also included in the geofenced areas. A large number of sites in the UK are also fenced off, including prisons, airports, immigration detention centres and Stoke City’s football stadium, among others. Ever thought about just banning phones? Haven't those poor souls suffered enough, you fiends?